Stained glass window image of Christ with hands raised in blessing. The image is on a dark blue ground with a panel of blue and aqua stripes at the left. 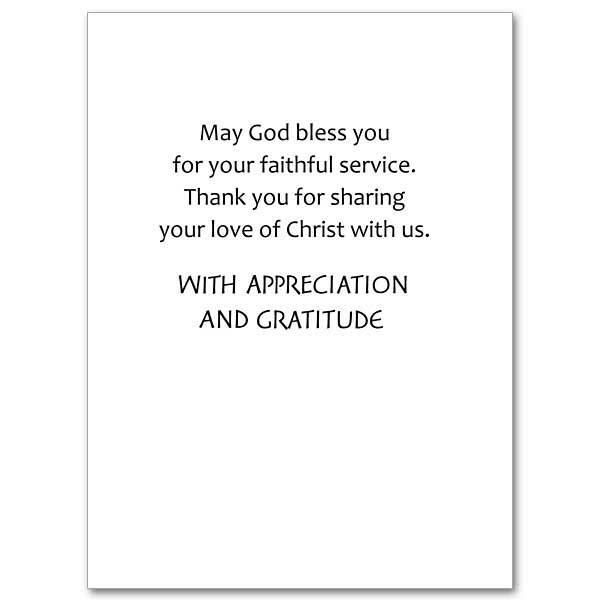 Rough wood cross and green leaves/vines on a greenish tan ground with a wallpaper pattern of handwritten "thank you"
The cards measure 5.93" by 4.38". Cross on watercolor ground with brush lettering. 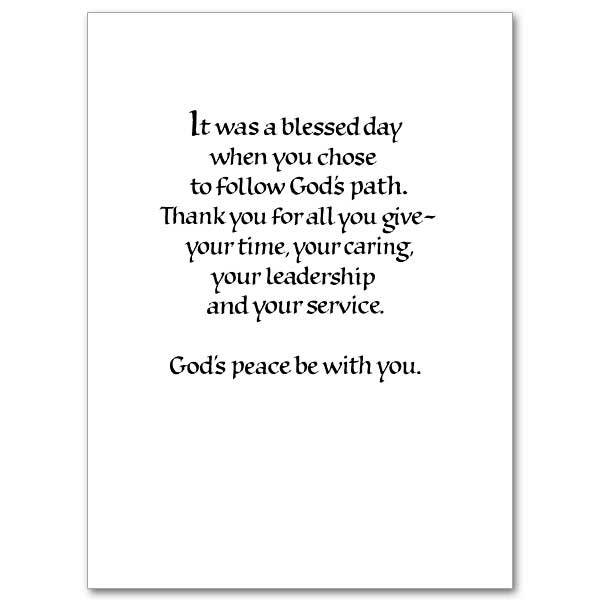 Appropriate as a thank you or retirement card for priests, deacons, other clergy or religious. Gold Cross in red circle flanked by palm branches. A prayer of encouragement in ministry is centered below the cross. 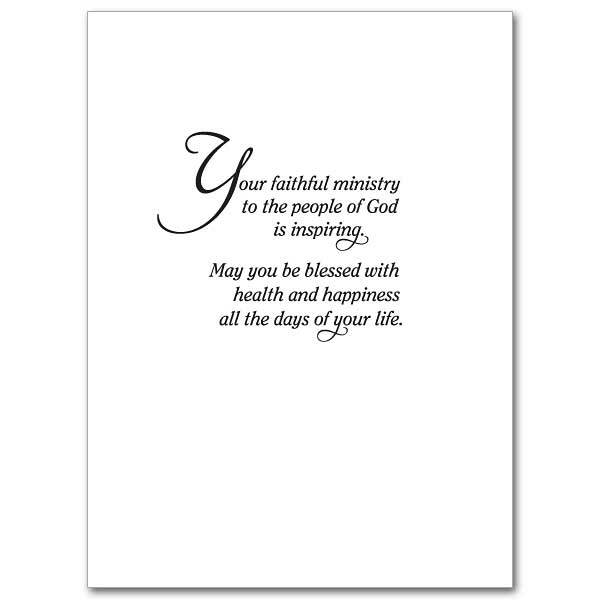 This is an appropriate card for priest appreciation or for any minister. A contemporary cross in blue brush strokes on background of a watercolor burst of light in shades of yellow, gold and red. A violet colored cross superimposed with images in red and black of a chalice and loaves of bread, a fish, a central cross and grapes and wheat. Photo of sheep in a green field with a shepherd&apos;s staff in front of the image. Ghosted treatment of the word "shepherd" at the right edge of the image with a screened version of the photo in as the background. Chalice and host, stole and gospel book on an altar. The altar is covered with a red cloth displaying the image of two deer drinking from the fountain of life. 5" x 7". Stained glass image of Christ the High Priest. 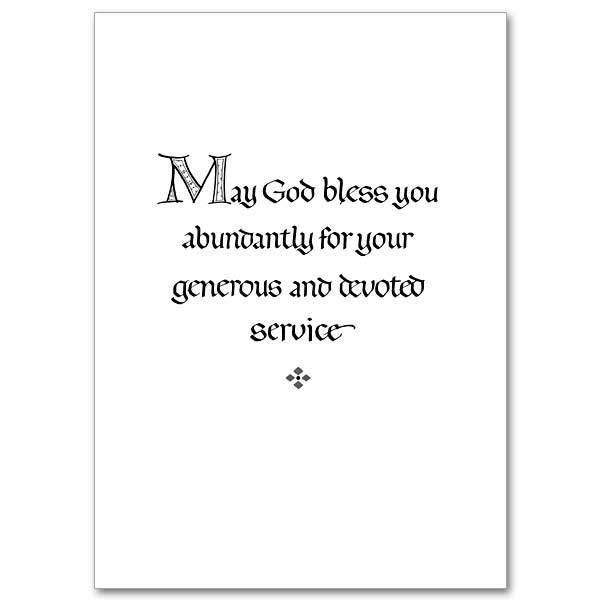 Appropriate as a thank you or retirement card for priests or bishops. 5" x 7". Gold Chi Rho with grapes and wheat. Appropriate for congratulating a newly ordained priest on his first parish assignment. A detail from a stained glass window showing Jesus washing the feet of St. Peter. Painted illustration of a blue colored cross with a diamond pattern before an open book of scripture with an illuminated start letter "A". 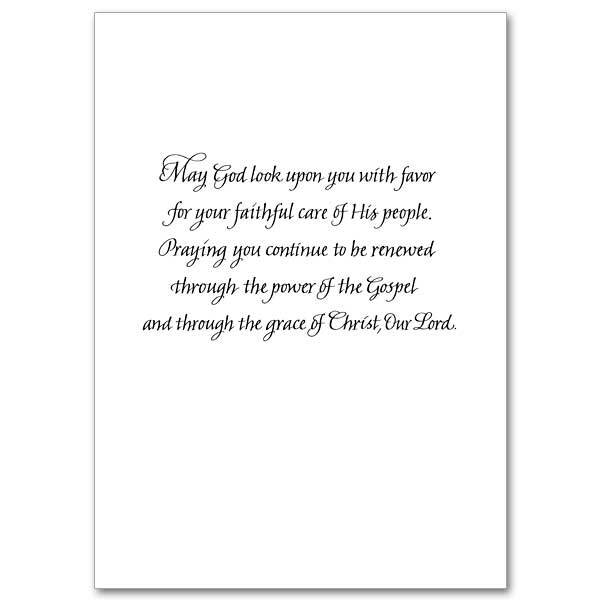 Appropriate as a thank you or retirement card for priests, deacons, other clergy, ministers, or religious. 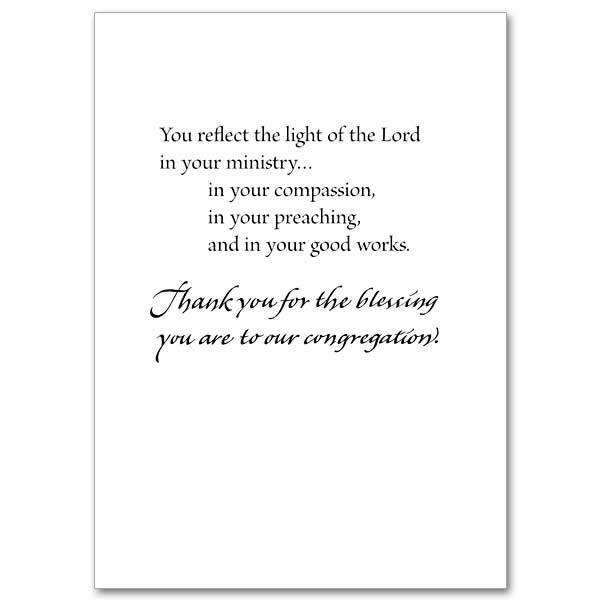 Express appreciation to your pastor, priest, or minister. The cards measure 5.93" by 4.38". Stained glass image of the appointment of deacons (Acts 6) from Gloucester Cathedral, Gloucester, England. 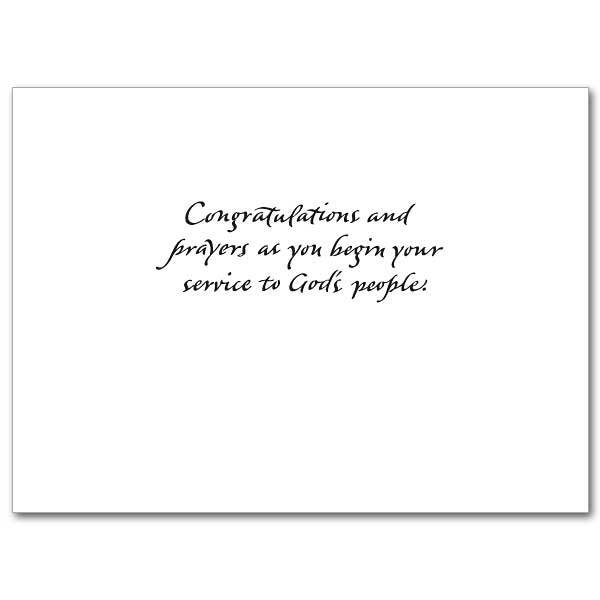 Appropriate as a thank you or retirement card for priests, deacons, other clergy or religious. 7" x 5". Cup with host, stole and Gospel book on a blue patterned background. 5" x 7". Celtic style cross in white with blue and oranges dots on a ring. Especially appropriate for priests leaving for a new assignment. 5" x 7". Silver foil cross on patterned ground.